In the world of gluten free eating, many people find themselves transitioning from refined wheat products to refined white rice and starch based gluten free products. The result is high sugar, low fiber, low protein. This combination is not ideal for a healing gut, or for long term health. In the past, I have praised breads for bringing a bit of fiber to the game, but Udi's is coming out with options that surpass previous companies, and I am very glad to see it. This is a great balance and when you compare the vast majority of breakfast cereals or prepared gluten free breads, you'll find they typically contain far more sugar and far less fiber. 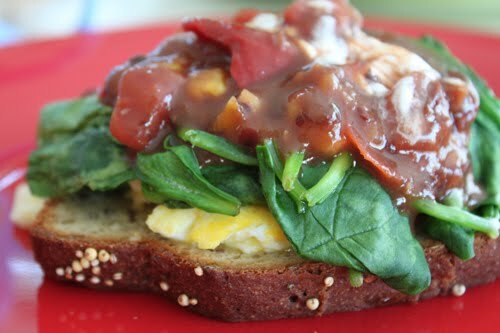 Served with eggs, greens, and salsa, this would be a fantastic breakfast rotation item. This is so much better than many alternatives have been in the gluten free market over the past 10 years. I'm excited to see this. Udi's bread has a nice textures, and it toasts up great. It's convenient as you can pick it up at many locations (Target, Whole Foods, many more). While it doesn't taste as good as a homemade bread, the convenience and health components are hard to resist. The package boasts the 530mg of Omega 3, which sounds wonderful, but the Nutrition Educator in me has to question if your body receives that Omega 3, or if it has already broken down in the making and baking process? I don't know the answer to that, off hand, but I would be interested in researching that further. The only other downside that I have to address is that some Udi's loaves come with large air bubbles in the bread, making it somewhat unusable. It doesn't happen with every loaf, but it happens sometimes. Udi's is aware of this problem and they are working on fixing it. In the meantime, if you have a loaf like that, save your plastic tag and information and just let them know via their comment section of their website for a replacement loaf. Hopefully their fixes will be made soon. In the meantime, enjoy your bread again! Just don't forget to balance it with fruits, vegetables, and healthy proteins. Not all Udi's products are dairy free, but these two are both gluten free and dairy free. Keep checking Udi's options for new and improved delights.